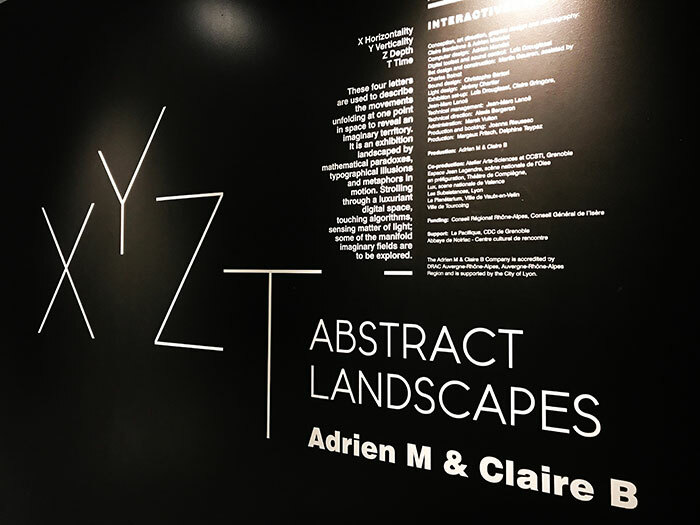 Last night I had a chance to see the XYZT: Abstract Landscapes exhibit at ARTECHOUSE – the show is closing soon, so I’m glad I had a chance to stop by. 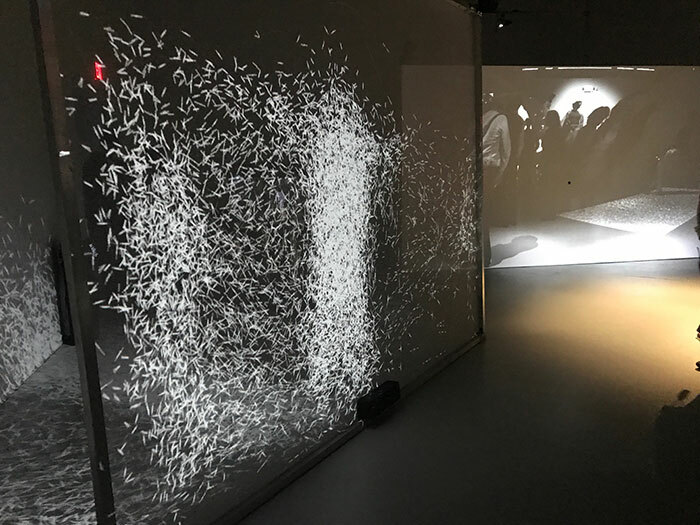 The exhibit is a world-travelled installation by French contemporary digital artists and multimedia choreographers Adrien M & Claire B. Lately I’ve been trying to get out the studio more to gather inspiration from other artists. And I’m happy I had a chance to see this show since it allowed me to experience an art exhibit in a new way. The show was a digital playground for people of all ages. I went to the evening admission, where only adults were admitted, and it was amazing to see how grown adults were playing with the exhibit like they were kids again. 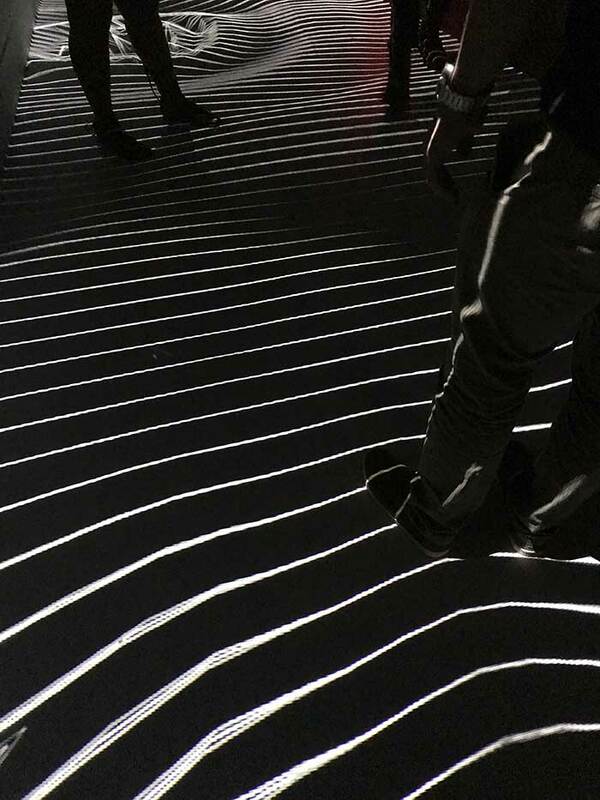 The exhibit consisted of several digital projections, and most of the projections were interactive. 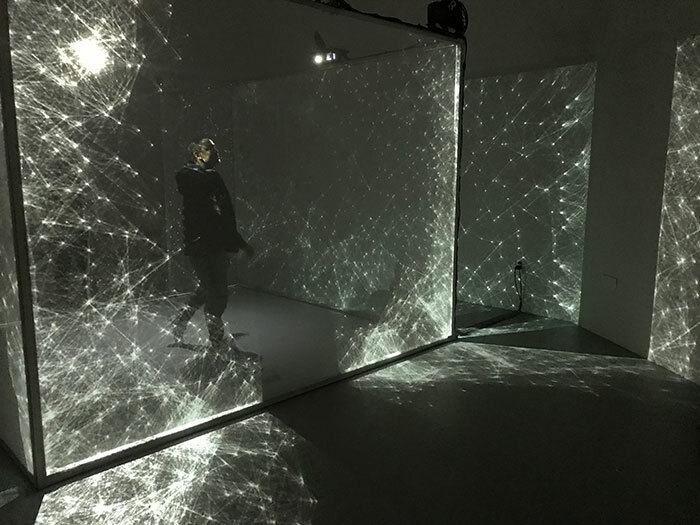 The image above shows a floor projection, where when you walked across it, the different particles would sense your movement and move. 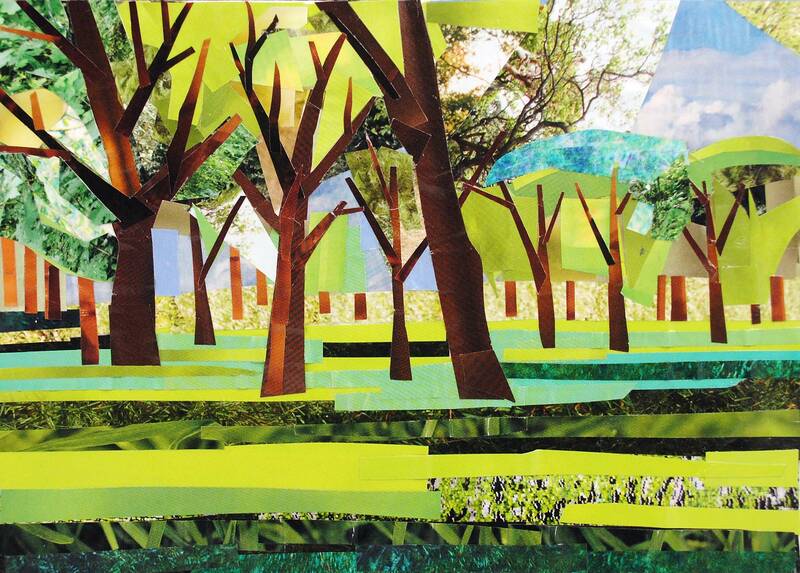 This pieces was a really fun, interactive one. 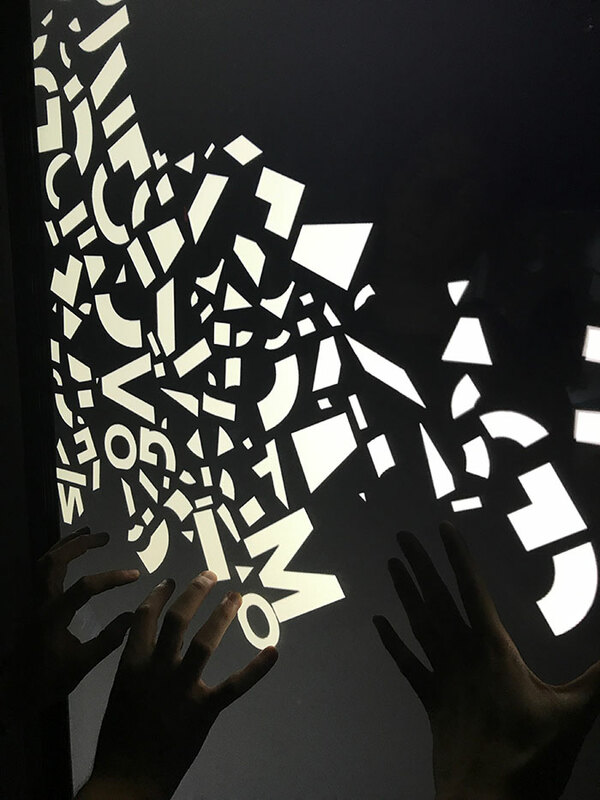 It was a large cube that you’d walk into, with letters or patterns projected on the walls. 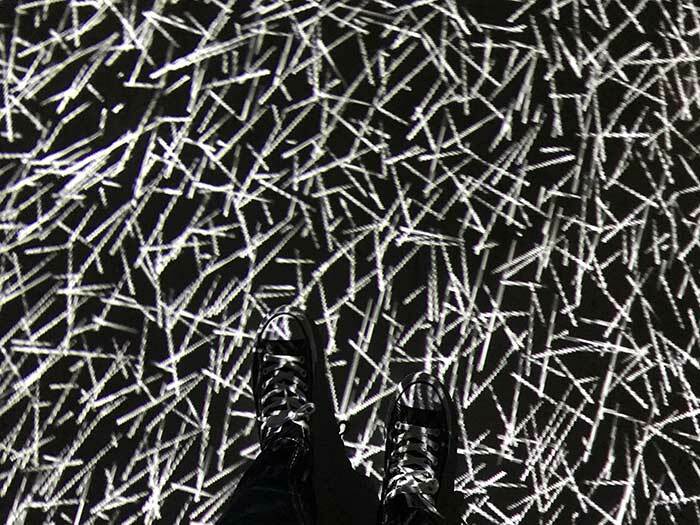 You could move your hands near the walls and the letters and patterns would start moving based on your own movements. 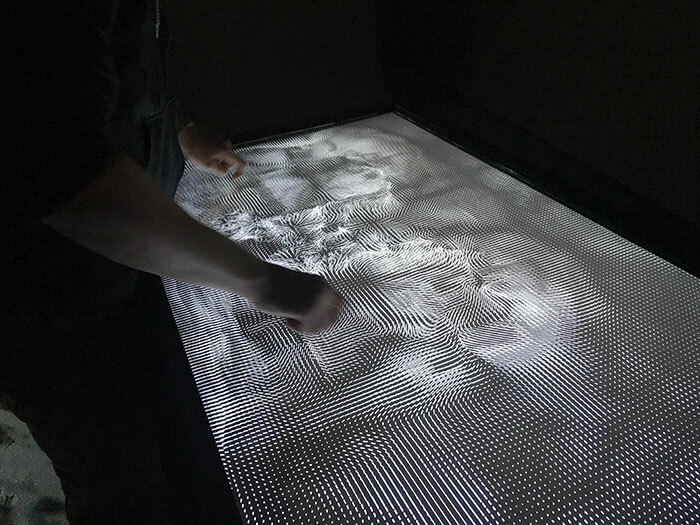 Here’s a touchscreen that had a pattern where users could create a ripple-like effect by pressing on the screen and moving their hands or fingers. Above is another touchscreen that had letters falling from the top towards the bottom of the screen. By pressing on the screen, the letters could get blocked by your hands from falling to the bottom of the screen. Probably one of my favorite pieces of a show was a projection that distorted the viewer’s body. It was like walking up to funhouse mirror. And lastly, here’s a piece where particles would clump together in sections where they sensed a viewer was standing. Overall, the exhibit was a refreshing experience. 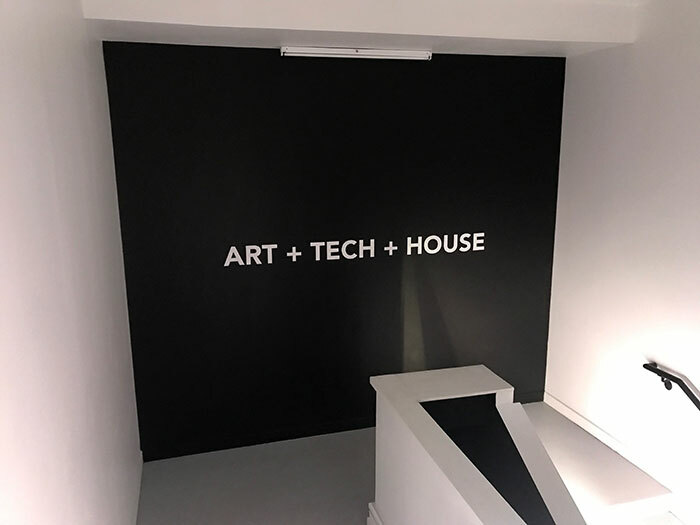 Instead of your typical stuffy museum setting, ARTECHOUSE has a modern look and feel, and the show XYZT: Abstract Landscapes let me experience the digital world of art in a new way. However, I did think the exhibit was a lot smaller than I expected. Despite being thrown off by the size of the room, the show was an incredible experience.